Not terribly pleasant, is it? The bird feeders under the ornamental cherry were one of the first things to be put up. In hindsight I should have taken many more pictures of the garden I started with. Each time I look at these first pictures, I can hardly believe the difference a few years of gardening made. I still fall into the trap of not taking enough “before” pictures when starting a large change. Even these pictures are not from the very beginning, in some of the shots I had already begun the process of clearing and tidying the worst of the mess and had even begun planting (you may be able to spot a small, young wisteria at the very edge of one of the photos). This first garden is actually very small but the wide range of conditions in it mean I can pack quite a lot in. The two main factors – soil and weather – have the last say on what will grow and what will not. With this garden being in Cambridgeshire the soil is on chalk and so is alkaline and unsuited to growing acid-loving plants such as azaleas, heathers and camellias. Even in such a small space there is a lot of variation in the soil. There are areas with heavy clay, which remain damp all year round (good for irises and hostas); in other places I’ve had to clear a foot of rubble just underneath the surface, so the soil there is stony, poor and free draining (good for wild flowers and mediterranean plants). In most of the garden the soil is light loam. I can tell that the people before us had conditioned the soil and so it is a lot better than it could have been. I built on that by adding plenty more compost and fertilizer regularly to gradually increase the soil quality and improve texture. The east of England is the driest place in the UK and although established plants won’t usually need watering, plants in pots and new and thirsty plants certainly will need a good drenching on a weekly basis during dry spells in the summer. For watering pots I found that filling buckets and crates with water and dunking the pots in for about half an hour is far more effective than watering from the soil from above, where it just runs off the top and over the sides. Being in the south the temperatures are generally warmer and we’re usually only beaten by the south coast, the south west and urban sprawls for temperature highs. This means I can grow a wider range of plants in these milder conditions, with the period between the typical first and last frosts being shorter than many other regions, making the growing season longer too. Winters can be cold, frost is regular and snow is easily possible. I have very few frost-tender plants (all in pots) and I bring them in when the night time temperatures start to drop to around 5°C (41°F). The easterly winter winds gusting along the flat fens can be a problem but the garden is well sheltered by the surrounding plants, trees, fences and houses so damage from the wind is far less than it could be. Winters aren’t usually very wet either so I’m not too concerned that dormant plants and bulbs will rot in the soil from the cold and wet. The enclosed and intimately private nature of this garden, with the house on two sides and tall borders on the other two sides create a sheltered microclimate for more borderine-tender plants to have a better chance of survival. It also means we’re able to sit outside in the warm calm, listening to the wind as it howls through the tree tops. There are roughly four borders of various lengths and widths that face the four main compass directions. The house side-extension with the patio create an “L” shape to the garden and even though it is small, there’s no one place you can stand and see the whole garden, this helps make it appear larger than it actually is. 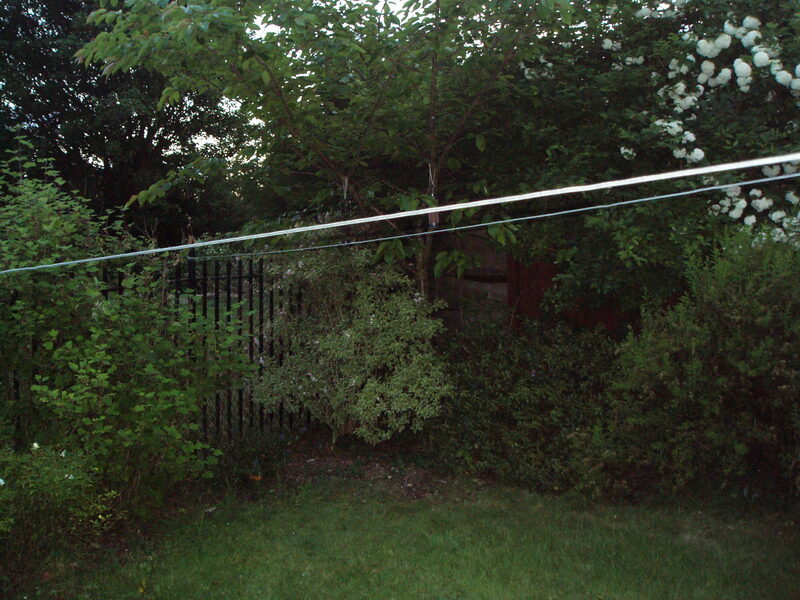 The area beyond the back of the garden is undeveloped so we can “borrow” the line of trees beyond the fence to make it appear as though they are also part of the garden, as though it extends much further out than it actually does. These co-incidental optical “tricks” give both a feeling of space, but at the same time, the garden has a “cosy” feel to it – and none of it was designed. This first garden was a gentle introduction to the world of gardening and after taking the first faltering steps into the horticultural world, I dived head first and in a few years, transformed a scrubby back yard into a piece of paradise. All was well; until I ran out of space. In this small garden the borders quickly filled and were bursting to maximum, no further expansion was possible; hemmed in by was and iron railings, I had run out of room. The only thing left was to leave this little piece of paradise behind and start afresh in a new location, with a brand new garden; one that was much, much larger than this tiny space and one that would keep me busy for a very long time; and that’s exactly what happened. I left my first garden behind in the depths of winter as it slept in hibernation. In the spring of 2014 this old garden would awake to new owners and another garden would wake to me as its new custodian.